Gaining 10 pounds of muscle is not the easiest task in the world but it’s definitely not the hardest task either. Adding a deadline of 4-weeks make the task more challenging but absolutely realistic. The key is to apply diligence and discipline to your the muscle building diet plan and raise your intensity when you pound the weights. If you’re goal is to pack on some brawn, I’ve designed a very simple muscle building diet to ensure you’re tipping the scale ten pounds heavier in a month’s time. Your muscles grow on calories – 20-22 per pound of body weight to be exact. A 180-pound man will have the challenge of consuming 3960 calories per day. Unfortunately, not all calories are created equal, which means 3960 calories of chicken wings, bagels and sausages will have a huge difference on how you look naked versus 3960 calories of lean beef, oatmeal and egg whites. You’ll notice in the sample muscle building diet plan that you’re consuming 2 grams of protein per pound of body weigh (360 grams for the 180-pound bodybuilder), which is probably double your normal protein intake. Why are you consuming so much protein? The main reason is to recover and regenerate the muscle tissue you break down while training and to ensure you don’t lose any muscle during your intense workouts. This amount of protein will switch on the “muscle-growing” switch inside your body and ensure you plenty of amino acids to support your growth to new levels. Don’t Take Away My Carbs! If you want to gain ten pounds of muscle in 4-weeks, your protein intake needs to be matched by your carbohydrate intake. Carbs will keep your muscle full and large and ensure you have enough energy to meet your weight training programs demands. So the 180-pound bodybuilder will strive for 360 grams of carbs each day. As you can imagine, this is a much easier task then consuming 360 grams of protein. Fat is not as critical during a muscle building diet plan but a certain amount is required to support testosterone levels. Shop for only healthy fats like mixed nuts, coconut oil, olive oil and avocado. Not only do these foots boost testosterone production but they protein your joints and balance your hormones. The challenge of a muscle building diet plan requires serious diligence and discipline to schedule your meals into your schedule, often times you must form new habits. I like the double breakfast strategy because your body can handle more calories in the morning and it mentally reinforces your goals for the rest of the day. Your first breakfast is designed to get into your blood stream quickly to prevent muscle breakdown and your second breakfast is designed to supply a slower-releasing form of energy for your morning. Since you’re energy demands are not as high, you’ll consume a lower amount of carbs to maximize the muscle-to-fat ratio and ensure you gain muscle, not fat. Also, we’ll drop our calories to 19 per pound of body weight, maintain our protein intake, increase the fat intake and decrease the carb intake the most. Tomorrow we’ll discuss a small handful of mass/strength muscle building supplements to use in conjunction with your 10 pounds in 4-weeks muscle building diet plan. As you’ll notice, this meal plan does not include any fancy foods or any outrageous budget to afford. The foods are easy to purchase and simple to prepare. 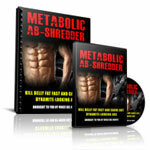 I followed a similar muscle building diet plan like the ones above to gain 41-pounds of muscle in six months. I’m sure you’ll pack on at least 10-pounds of muscle in the next 4-weeks with this muscle building diet plan. Feel free to ask questions and tomorrow I’ll share some muscle building supplements to compliment this plan. P.S. If you want to pick up some Iso-Smooth protein powder, you can buy it at http://bluestarnutraceuticals.com/ Include the coupon code “maximize” for a free shaker cup. Outstanding post, I think website owners should acquire a lot from this weblog its really user pleasant. So much fantastic info on here :D.
do i need to work out every day? the pain is preventing me from working out every day. Great article but I think you are missing some primary factors that a good muscle growth diet plan should have! I’ve made some search online and I found that there are 7 factors that you should focus on! And these factors are frequency, calories, protein, carbohydrates, fat & water, protein shakes, and supplements. What if you can have “Greek God” body that women desire and men envy? Thank you for such detailed and well explained diet plan. But what someone like me should do for whom dieting is really a tough job because of being foodie. My friend suggested me to go for this https://finance.yahoo.com/news/dieters-craving-binge-stopper-really-110000360.html . Please tell me more about this. In search of healthy lifestyle products? Stay healthy, stay fit with 100% genuine healthcare products, just at your fingertips. 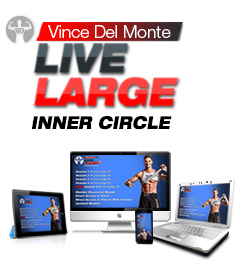 Pingback: Vince Delmonte Meal Plan - Totally Free! my shop doesnt sell iso-smooth protein can i use somthing else that will work just as good. Lol because I just found this post (from a year-and-a-half ago). Anyway, I’m 15 and I’m going to be starting this plan in a few weeks. However, where I live some of these foods are not easily obtained. Could you please tell me the ratio of Protein-Fat-Carbs? In that case I may be able to make my own diet plan. Also for my diet plan how many calories should I eat? I am 5’8 and 110 pounds. Just one question you prob. got before, I work out first thing in the morning and if I have a solid food breakfast I feel sluggish for a while, normally I just have my protein shake, creatine and glut. also a cup of coffee. then go to gym. Any suggestions are appreciated, keep up the good work your the best. Thanks for the MYM/10, which came yesterday into my large post box. Looked at the 1st 3 days today. Great stuff! I wonder if I could take part in the coming competition, but better perhaps to give some room for other young men… I doubt, if I could impress people this time as much as in the autumn, probably no way to do that. Those good advice on what to put into our mouths made me hope to print it all, but I do not know how. Only a short part of it appeared to be printable, and I am not able to copy it all by writing those lines with my own hands. It would take too much time to do that! Can you help? That is: how to print it all at once? Thanks for all your kindness and Best Regards from Aimo, Spain. Anyway, I enjoyed the topic and hope to put in a good word, you have the gift. What a great meal plan. I have been looking the change up my current meal plan that I have been following for a few months and this looks great. My questions is how would you change this meal plan for a morning workout. It is usually 2 hours from when I wake up before I work out. By thought is to just move the pre/post work out meals before Breakfast 2 and have Breakfast 1 when I get up. Thoughts? Nice! I’ve been looking for a short meal plan like this for my daily diet. Thanks for posting. Isn’t 5 scoops of protein powder a bit much? Seems like most of the protein in that diet is powder. Is correct? Vince plase advise. Thanks! Hey Vince, do u got another option beside banana for post-workout carbs? I just don’t like it that much. Thanks for the plan Vince…. quick question though, because of work, I train at 9pm… do I need to re-structure the meal plan accordingly? Appreciate your advice. Thanks. In the morning, I always take only hamberger. But some month I want to test something I double my breakfast and result is I have more muscle than ever. Could you do Hiit cardio after breakfest one? And lift on the same day later on? how would post workout nutrition go for the hiit cardio after breakfast one and in general? Sorry for straying off topic, but I just discovered this website and its fantastic. I'm allergic to eggs. Is there another substitute for eggs that I can use to get close to the target grams of protein? Does this meal plan need to base on one's weight also? I mean i am 160 pounds so can i also use this meal plan? Thanks in advance. That's a heap of calories. Which is needed to build muscle I guess. My bodyfat is around 9% and I'm too scared to loose my abdomnals, I want to grow more but not gain fat. I have to get my head around eating that much! I try to Carb cycle but I still think i'm undereating. I'm lifting as heavy as I can with intensity and progression but its the Diet holding me back. Great meal plan. I got a couple of questions tho. How much roughly gram wise is in a cup portion and also do you use milk with your cooked oatmeal or just water? Hey Vince, I am a skinny hardgainer 16 year old who goes to the gym and desperately want to pack the pounds. I eat 5 meals a day but seem to be gaining quite little weight. any advice on how to adapt to this mealplan. Couple questions concerning the 4 wk/10lb gain. When you speak of raspberry jelly and cheese, do you mean SUGAR FREE jelly and FAT FREE cheese? Also, 2 FULL HEADS OF BROCCOLI? The pre-bed snack, your talking a FULL CUP of mixed nuts? Thats a MASS amount of fat right before bed? 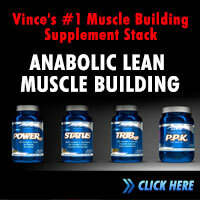 Hey Vince, the Muscle Building Diet Plan is precise and takes the guess work out of an other wise daunting task! For my first breakfast I drink a green smoothie, it consists of blending 1 scoop of Garden of Life, perfect food, a fist full of fresh greens( change up the greens every couple of weeks) a banana, 2 tbl sp.chia seeds, 2 tbl sp.hemp seeds, 2 raw eggs, 1/2 cup of apple juice and 1/2 cup of crushed ice. Right before the end of the blending cycle, add a scoop of Protein. Hope this is helpful! 1. i’m a 64kgs guy and making numbers i need 2800-3080 calories to put some weight on me. Do i have to follow this meal plan with the same amounts of food as it is mentioned? This meal plan looks great..def more cost effective than the ones with nnmb…what about milk & yoghurts…should I still eat them or change to this…thanks! Hey Ian. Leave the dairy out on this meal plan. u mean not even skimd milk ? This looks like a good plan however I have two questions 1) How does someone who works out in the morning incorporate the extra pre and post work out meals… That seems like a LOT of food in the morning and maybe not very manageable for those who need to get to work on time. 2) For females, I am guessing we eat less… any suggestions for a serving size for someone 120? Great plan and completely do-able. 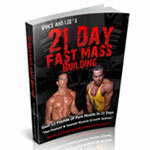 Try to add one 24 hour fast day in each week to lose your fat. Thanks a lot for sharing with us these information, you always motivate and make us do our best to reach our goal. 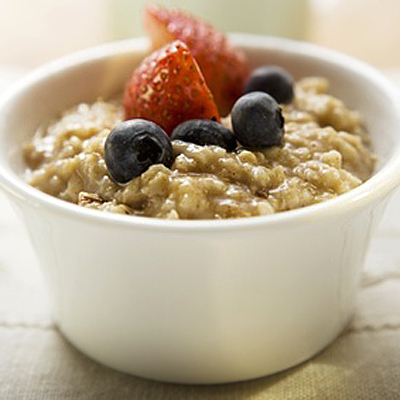 I got a question considering the breakfast meal, I can't find a good recipe to cook oatmeal, can you please provide us with a good recipe to cook oatmeal for breakfast? Absolutely. 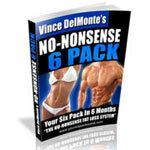 Gethttp://www.NoNonsenseMuscleCooking.com from Dave Ruel. He's a good friend. Just hung out with him in Quebec this past weekend and his recepie book was compiled over a 4 year period. he's got lots of tasty ways to work with oatmeal. I will definitely get it as soon as possible. Thanks again. What would an example meal plan be for a thin 120 lb 5'6'' female look like who wants to gain lean mass? I'm new to the site. Is a meal plan like this suitable for upside-down training, or does the meal plan have too many calories for the UDT routine? It's perfect to accommodate Upside Down Training. You hit the nail on the head with this one. When most people want to "bulk up" and build muscle, they think the key is just to get as many calories in them as possible. When adding muscle, you have to be just as strict about the quality of the calories as when you're burning fat. By the way, cottage cheese before bed is one of my favorites! Thanks Chris. I don't do as much cottage cheese before bed these days but I used to when I first bulked up. What training program to use with tis meals? 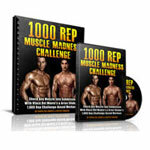 No Nonsense Muscle Building or Maximize Your Muscle. Even Your Six Pack Quest if you want to use those weight training routines to gain muscle. Can you substitute the raspberry jam with other jam? Yes. Blueberry or whatever your pick. the double breakfast. how much time between Bfast #1 and Bfast #2? About 1-2 hours. The best situation is to eat at 6am, do some am cardio, then have breakfast #2 right after. Just want to know. I’m training 5:30am, what should I have pre workout. Breakfast 1 is your "pre workout" meal. LOL… I could do that but I'm not the expert on vegetarian or vegan info. Craig Ballantyne has a great veggie meal plan product. A question … When you say Blend the Oat meal with the protien shake ? Do i cook the oatmeal with milk first and then blend it with my protien shake OR ???????? So if I blend the oatmeal in my shake widout it being cooked .. Not a problem right ? and one more thing . are there diffrent types of oatmeals ? Definitely! You'll find the raw oatmeal will blend surprisingly well in a good blender, and you'll hardly 'notice' it in the blend… I have raw oatmeal in 90% of my morning shakes… try it and see! Just water is good. I blend the protein powder in hot water and then pour it on the oatmeal. It is an awesome plan Vince but I am a vegetarian. What would you suggest for me? Search my site for vegetarian plans… I'll work on that in the future but not a huge supporter of the vegan or vegetarian lifestyle – nothing personal in any sort of my way – just not my personal preference. 2 slices of whole wheat bread only? it only has like 27grams of carbs. i take 6 slices with natural peanut butter. at least then catching up with carbs for the rest of the day would be easier when you're running short on time or so. yeah 6 slices of bread and trying to keep a six pack at the same time good luck! imagine when added up the sugar and carbs in the bread eventually it would be a six pack killer yeah you would be bulky but thats about it, you would go from bulky to fat. Hey Anna, you're right, this plan could include some extra veggies. They are "free" foods anyways so you can add them in yourself. That is one torcherous post to get through on a XFLD fast day. Thanks for the meal plans Vince! Just wrote a post on my blog giving you props and pointing my readers over to your page. Thanks man… appreciate the affiliate support. nice looking site too. Love the name. Double breakfast! That's how important it is.